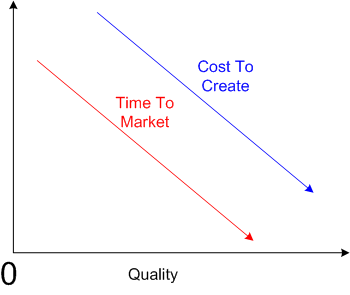 Maybe it’s just me, but I think that some people, especially managers and executives, auto-equate decreasing “cost to create” (CTC) and decreasing “time to market” (TTM) with increasing “quality“. Actually, since they’re always yapping about CTC and TTM, but rarely about about quality, perhaps they think there is no correlation between CTC/TTM and quality. But consider the polar opposite, where decreasing the CTC and decreasing the TTM decreases quality. I think both of the above cases are extreme generalities, but unless I’m missing something big, I do know one thing. In the limit, if you decrease the CTC and TTM to zero, you won’t produce anything; nada. 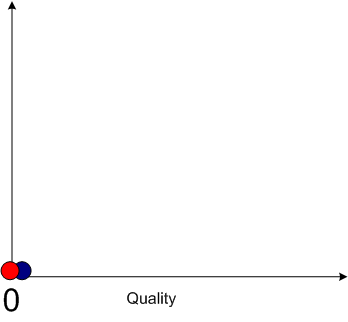 Hence, quality converges to zero – even though the first graph in this post gives the illusion that it doesn’t. 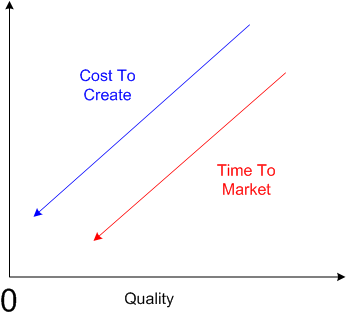 Time, Cost, Quality: Pick any two at the expense of the third. Note: If you’re a hip, new age person who likes to substitute the vague word “value” for the just-as-vague word “quality”, then by all means do so.